Because of our excellent understanding of Goodwill’s needs, LANE4 was selected to build a 10,000 square-foot, free-standing facility for the national retailer. 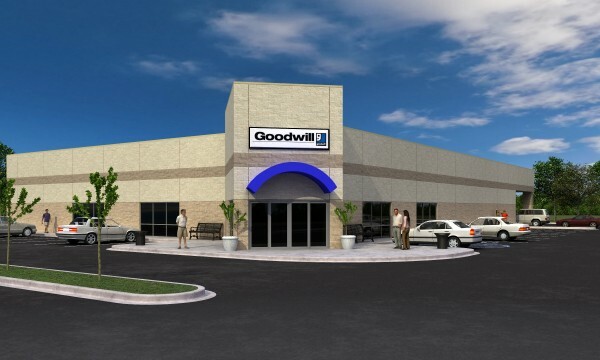 Located in Pittsburg, KS this new location serves as a retail store as well as donation center, and was designed to fit Goodwill’s recently re-branded image. The new facility focuses on providing a clean, simple, upscale shopping experience, and a quick and convenient location for donation drop-off. Goodwill Industries International is a 501c(3) non-profit. Goodwill trains people for careers in fields such a financial services, computer programming, and health care. The organization provides employment, job training and other community-based programs for people with disabilities, those who lack education or job experience, and others facing challenges to finding employment.